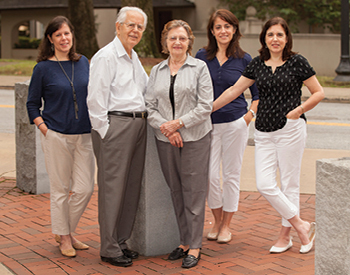 Family is important to Pete and Pauline Giannakopoulos and their four grown daughters. Golfo, Patty, Anna, and Kathie have stayed close to their parents in order to share family joys and sorrows. "We are the typical big fat Greek family," says Golfo, the second daughter. "Except we roast the lamb in the backyard, not the front yard." What the family might also share, though, is a genetic mutation that puts some of them at risk for a certain type of cancer. Their lives changed in November 2014, when Kathie, the only sister to move away from Atlanta (to North Carolina), was diagnosed with medullary thyroid cancer (MTC). The Giannakopoulos family met with Winship genetic counselors to investigate their risk for medullary thyroid cancer. Just a few months after having her thyroid removed, genetic testing revealed Kathie carries a mutation in the RET gene associated with a diagnosis of multiple endocrine neoplasia Type 2A (MEN2A), a hereditary condition that greatly increases the risk for getting medullary thyroid cancer. Kathie urged her siblings to get tested, and "I even called [Winship Cancer Institute's] Genetic Counseling center myself," she says. Speaking with Christine Stanislaw, director of the program, Kathie provided information for the first branch of her medical family tree. The sisters were all screened for symptoms of thyroid cancer, including neck nodules and high calcitonin hormone levels. Then, in mid-August of this year, Golfo, Patty, Anna, and their parents arrived together as a family to meet with Stanislaw for their genetic counseling session. Together they learned what genetic testing entails and what it could reveal. The outcome was important not only to them, but also to 17 first cousins on their father's side and four first cousins on their mother's side. Depending on the results, the cousins and their children might need to be tested too. Actress Angelina Jolie's very public revelations about testing positive for a BRCA1 gene mutation that increased her risk for breast and ovarian cancers may have led to the belief that hereditary cancers are prevalent, but the reality is that only about five to ten percent of all cancers are believed to be linked to an inherited genetic change. So far, about 50 hereditary cancer syndromes have been identified, according to the National Cancer Institute, that can increase the risk of breast, ovarian, thyroid, pancreatic, colon, and other cancers. Individuals who come to Winship and meet with Stanislaw and the two genetic counselors on her team learn about the risks, benefits, and limitations of genetic testing in each person's specific situation. "Genetics can potentially help determine the cancer risk level for an individual," Stanislaw explains, "but unfortunately it doesn't give you the 'when, where, how and if' answers. No genetic test can say with 100 percent certainty if a person will develop cancer." Counselors explain how a genetic mutation gets passed down, what testing is available for which cancers, possible prognoses, and treatment options. "In an ideal world, we want to be able to test someone with cancer first, to see if the cause is of genetic origin," says Stanislaw. 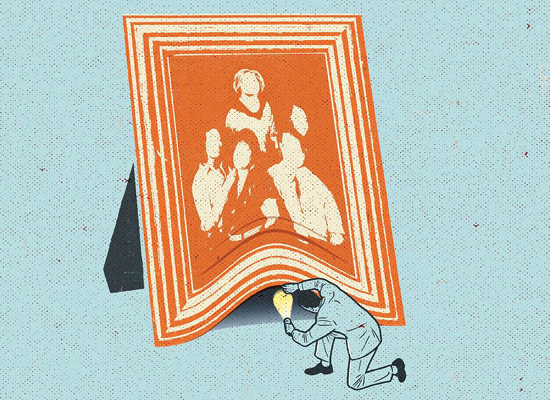 "Then a determination can be made about whether other family members might benefit from genetic testing." That's why Josh Ream met with Stanislaw. He's a 36-year-old cancer survivor who had undergone colon cancer surgery just months earlier. Ream, a diabetic, was suffering from increased gastrointestinal symptoms. Reading about a 35-year old former Dallas Cowboys player who died of colon cancer prompted Ream to get a colonoscopy, even though it's not usually recommended for men and women until age 50. The colonoscopy found Ream's cancer and the surgery successfully removed it, so he's not meeting with Stanislaw to determine his own cancer risk. "It's truly not about me," he says. Ream wants to know if his 18-month-old son is at increased risk. After reviewing his personal and family history, including the fact that his mother survived colon cancer at age 54 and breast cancer ten years later, Stanislaw thought it worthwhile to investigate whether Ream has Lynch syndrome, known to greatly increase the chance of getting cancers in the digestive tract. Stanislaw recommended testing Ream's DNA for the five known genetic mutations linked to Lynch syndrome. The tests showed he does not carry those mutations and were negative for 27 other cancer susceptibility genes. This significantly decreases but does not eliminate the possibility of a hereditary cancer risk in the family. During their meeting, Pete, Pauline, and their daughters provided more information and the results of the sisters' recent screenings to fill in the medical family tree. Patty reported that her screening did not reveal anything of concern. Golfo's screening led to a diagnosis of thyroid cancer and a thyroidectomy in late August. The youngest sister, Anna, does not have cancer, but nodules were found and her calcitonin hormone level was elevated. Stanislaw says the family met the criteria for genetic testing. Even the parents, who are in their 80s and never had any thyroid problems, were tested to determine which side of the family may have the mutation and in turn how many other family members in the United States and in Greece should be tested. Kathie's mutation in the RET gene is called p.G553C. It's one of several known mutations in the RET gene that causes a diagnosis of MEN2A. This mutation is what the other sisters' and parents' DNA tests zeroed in on. The sisters worried—about their children, not about themselves—because if they have the same mutation, there's a 50 percent chance their children have it too, increasing the risk of getting medullary thyroid cancer by at least 60 percent. A few weeks after their blood samples went out for analysis, the family received results that revealed which side of the family carries the genetic mutation. They have requested that specific information remain private until they have notified all family members who could be affected, a big job but one that the sisters feel more confident tackling now, armed with knowledge. 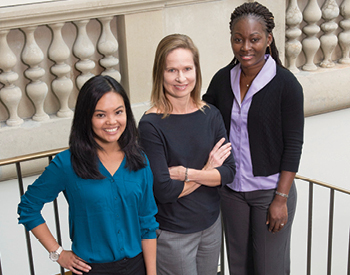 Winship genetic counselors Christine Tallo, Christine Stanislaw, and Fabienne Ehivet. WHAT YOU CAN LEARN: Genetic testing looks for changes in genes that could increase the risk for disease. This type of testing usually involves collecting a sample of blood or saliva. Individuals can have genetic testing to determine if they have an increased risk of cancer and could have passed this risk on to their family members. management of at-risk family members, confidentiality, insurability, and family planning.